In my work and play I enjoy hand crafts and expressive artistry. One of my favorite places to go for inspiration is Michael’s Craft Stores. I can always find a wide array of color, forms, glitter, ribbons, paper and most importantly, my very own imagination, right there in the store with me. I like to check out the scrapbook section for new items, because I’ve known the value of journaling for myself and in working with children. I learned from my mother – a master teacher of creating beauty, something from nothing, inventions and gifts. my own awareness of the preciousness of one’s life and not to waste it. Ribbons.” Wasn’t that perfect? Thus was my synchronicity, or “God wink,” as my family would 1 refer to it. I thought to myself, “What a beautiful way to inspire the preciousness of one’s own life.” This got me reflecting, feeling, and behaving with renewed appreciation for “what is,” and for all my blessings. That might sound trite, but it’s deep if you truly get the meaning of the words. it-all attitude. They reported that Cynthia upset her grandmother, an accomplished artist, who came to sit with the girls for a couple of days. She harshly told her grandmother she knew nothing about color and the art project for school, and to “bug off.” Another incident occurred the night before Cynthia’s piano concert when her mother, having been a Iulliard music student, offered a few practice techniques. Cynthia’s retorts were quick and hurtful. “She is not even open to a suggestion,” her mom would lament. I understood. I felt June’s anguish and shame at having a daughter who came from privilege to be so disrespectful. “How does this happen? I’ve tried in many ways to reach Cynthia, but with no success,” said her mom. One of the reasons I am able to “reach” kids is because I am one – forever young! A‘solution might pop into my head that is literal, light-hearted, in tune with a kid’s way of thinking, and smack~ing of attitude. In short, a “one picture is worth a thousand words” lesson. The following technique came to me as so many do, while having a normal day. As I was passing through the dining room where we had left birthday decorations up on the walls, my eyes looked upward. Remember the banner “Every day is a gift, untie the ribbons?” I suddenly got an idea for June. I called her and said, “June, the next time Cynthia is rude or disrespectful to you, I’d like you to try something new in response to her. Are you interested? “Yes, definitely,” she said. I instructed II her get an empty jewelry box and place a heart inside the box. I explained that it could be cut out of pink paper or made of clear glass or a pink stone. Luckily, lune had a rose quartz crystal heart. 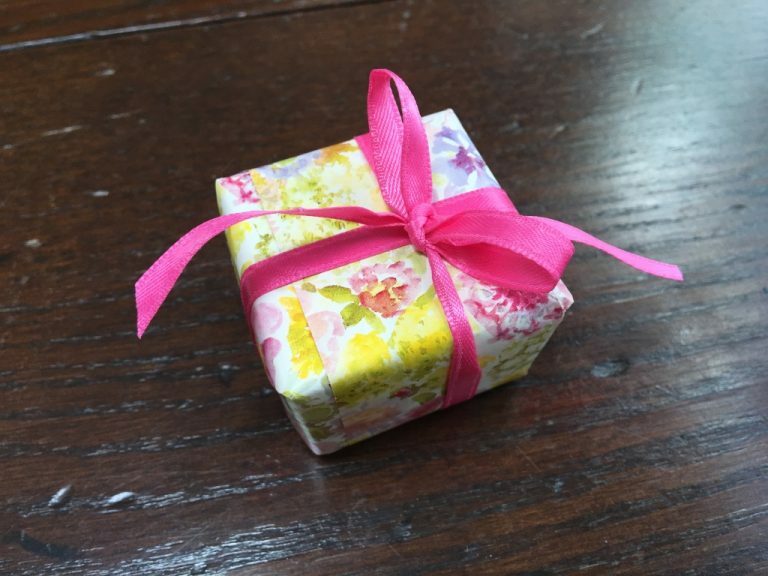 I told her to place the heart on a piece of cotton inside the box, then wrap the box and tie a ribbon around it, just as she would with any gift for Cynthia. have placed the little box in front of you. Be sure she is watching as you whack it enough to shoot across the table. Then retrieve it and put it in front of Cynthia and say, ‘Cynthia, when you refuse to stay Open to suggestions, which I offer with good intentions, it’s like you bat away this gift that is being offered to you, rather than seeing it for what it is, a gift which you can open and see what’s inside. Now, Cynthia, I’d like you to sit with it, hold it, open it and see what’s inside. As instructed June did this with Cynthia. Cynthia recognized her mother’s gesture as a gift. June could see Cynthia’s physical stance softening as she opened it, and received her mom’s heart. She was able to see her mother’s intention. Cynthia smiled at June, then took off to show her younger sister what had happened. Just as opening the jewelry box unleashed a new way of thinking for Cynthia, so too can stress – when handled positively – unleash healthy ways of coping with problems. as well as another’s. We are cultivating empathy. or the problem is mean, hurtful physical pushing away, both are unskillful ways of handling intense emotions. However, if a parent is alert to the situation, these situations can become powerful teaching opportunities, rather than impulsive incidents when we ridicule our child for unacceptable behavior. Intense feelings like anger, jealousy, meanness, and unkindness sometimes surface in our children. How we handle these episodes can lead to new skills or cause more resentment and even hate. This is why I urge parents to be alert to the teaching opportunity here.Then you can, literally, “stop-action, reflect and reframe”. behavior was felt as the rejection and hurt she so carelessly dished out. “One picture is worth a thousand words. !” Further, showing the feeling in action, can be more powerful than telling about the feeling in words. deep empathy. This is how we model right action, I call, behaviorship and thoughtmanship.